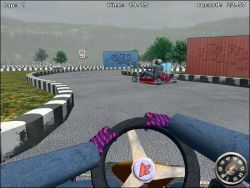 CJ's Review on "Beer Truck". 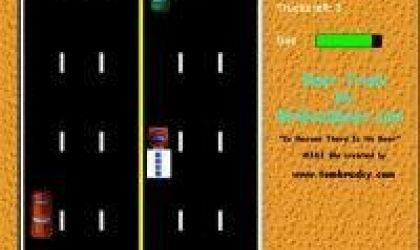 I've come across many games on freeware game sites but this is the worst I've ever seen. My opinion is that this game's author wanted quick cheap fame or a cheap commercial. 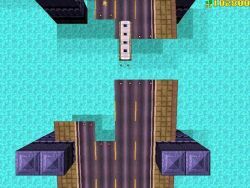 I havent't looked at its "code" but it's not hard to tell that he started "Game Maker" by Mark Overmars, opened the pre-made game Street Racer, changed the name, some sprites and other images, the music and there you go - a cheap boring game which I do not recommend. I think the author should pay us for downloading gand playing it! 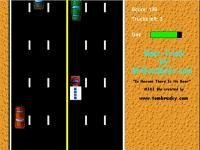 The story line behind Beer Truck, is that you have just stolen a beer truck and must get the beer to safety. You must avoid all the cars and watch out for the cops. You need to collect all the petrol containers on the road to keep going or you will run out of fuel. This game is very boring as nothing really happens. You just drive very slowly and this really does put you to sleep. I got Beer Truck off a demo disc that came with a PC mag. I installed it and played it straight away. The game is very slow, but also quite addictive.